It's the sputtering start of spring, bouncing between grey and bright, wet and dry. I need a lift, something that signals the season. First, something off the runway just to get us in the mood. We all have the bread and butter basics, but an aquamarine Mongolian lamb chubby? You get my drift: I want some kind of green to play off the neutral core of the closet. The pieces below show the green range, but some may be s/o already. Green things, as my Parisienne friend Huguette says, should be scooped the moment they come out and worn as soon as possible, so that everyone is cheered by a flash of fresh. Turquoise (in fact almost Tiffany blue), is a sublime mating of blue and green, with shifting ratios. An unexpectedly useful shade, if you can wear it. 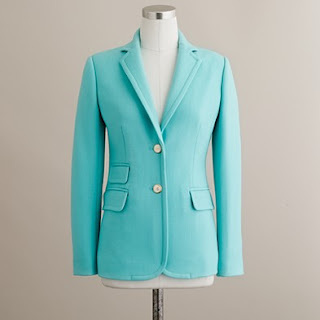 A turquoise hacking jacket in double-serge wool (J. Crew; price, $250) would pick up your jeans and is chic with bitter chocolate. Leaf or grass? J. Crew call it Caribbean; my family calls it golf-course green. I nominate this sweater to spring up my jeans. (And this time I'll be good and dryclean like they say, or at least handwash. The machine ate my last one.) Linen v-neck cable sweater, price, $69.50 from J. Crew. Apple: the green of sunshine and soft breezes, a gentle but not insipid hue. 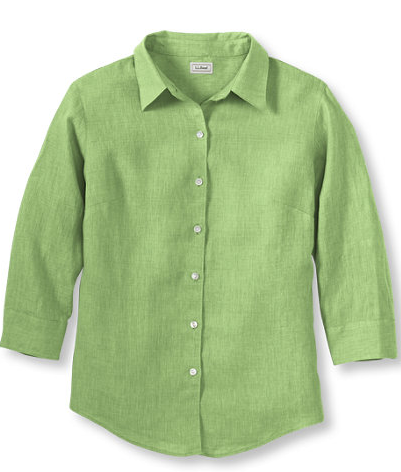 I have owned this very LL Bean washable linen shirt, and probably will again. Both the sleeve length and price ($45) are right. 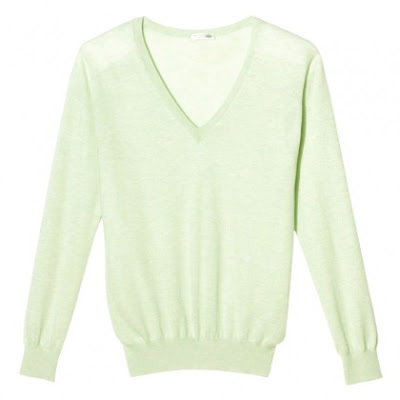 The colour Eric Bompard call bud green is soft and delicate, but uncommon, too. These refined colours are why I continually order from them. Shown, the extrafine 100% cashmere v-neck pullover, price, €198. 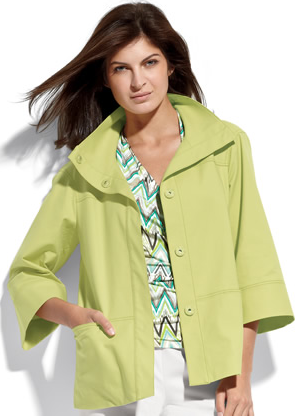 Not in the lineup is the olive/khaki axis of green, which is versatile and pleasing, but not a herald-of-spring hue. What has caught your eye for spring? Is it a colour, a mood or a specific piece? 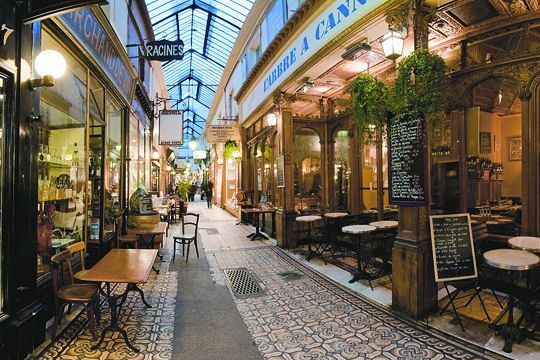 I love green, but all the examples are too light-hued or bright for my personal taste, except perhaps in accessories. Other than olive/khaki, there are also deeper greens without the yellow/brown in olive/khaki. I'm looking at my houseplants - my ficus benjamina tree, my jade plant etc. Or certain bottle greens. They are very hard to find, alas. Hmmm, perhaps this is what I need a shot of, the fresher, lighter greens, very spring-like! Generally, the more wearable colour for me is olive/khaki, but I'd definitely be willing to try that Mongolian lamb vest! Mint's getting a lot of play around here. But I have to stay FAR away from green, unless it's an olive that verges on brown, or a forest that verges on marine:). Green is my favourite shade but I rarely wear it. our reno's are gobbling up money fast! Read "An Ode to Olive" from A Suitable Wardrobe blog. kathy peck: Ohh, green jeans! Love that. Vildy: Pretty colour to surround yourself with; less wearing than neon chartreuse. matherfamilias: Like you I love olives but they are just not that "essence of spring". LPC: Mint and you were made for each other, mmm. hostess: The more intense hues like leaf or golf-course look wonderful with black and I bet you could wear them. Anonymous: Olive is not at all what I am wishing for at the moment, much as I like it, it's just a green I want right now, and I wear women's clothes. Are you the writer of that blog? I do wear green because I have green eyes and rosy skin and am blonde going silver so I think it still works for me. Duchesse, I am so interested to know how you might style the basil Bompard dress. 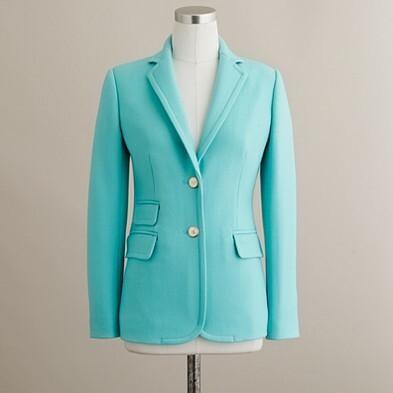 Would you wear it with a cardigan or a jacket-- maybe navy? Or maybe a big scarf? Thank you! C.: Awww. Green can have yellow or blue undertones (or brown, which takes it to olive), so it is warm or cool, and therefore there's theoretically a green for you, but it may be just too much trouble to uncover it. I see it with a coral bead necklace, white or yellow pearls, or a yellow gold chain with a charm. A light, charming dress, like a glass of lemonade, perfect in its simplicity, so you don't need to do much to it. Duchesse, I love everything you picked out! You are a stylist! 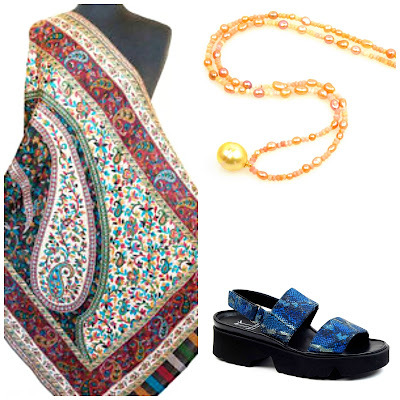 The necklace is beautiful and so are the scarf and shoes. Thank you so much for taking the time to show these pretty accessories. I like your point that the dress needs a light touch. the bompard dress catches my eye. I love those greens -- we're just seeing the first out-of-focus leaves around here, and that tender yellow-green they have. Thanks for the reminder that we can leaf out our wardrobes, too. No "proper" green in my closet right now, but I have been wearing the heck out of a mint/turquoise cardigan and similarly shaded blouse (with white polka dots!). I feel very springy! I was feeling spring anyway, so your green post is just the ticket. I found in my packed-away wicker chest a green cotton cardigan: a green kind of like those 1920's enamel cannisters and table tops, maybe a bit more yellow than that. Not my very best color, but with a chocolate brown silk turtleneck and pincord pants, it's quite trans-seasonal, I think. 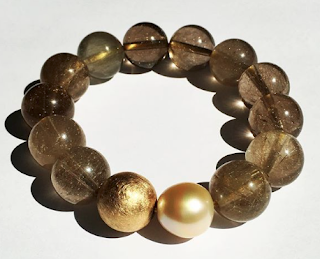 I've added a string of bronze-rose cultured pearls, just given to me by my sister for my birthday. Love the dress, love it! Swissy: That is an unusual, retro green. Sometimes you find a green like that, kind of indescribable and even if not your "perfect" colour, it is unusual and interesting. Lucky to have that! Green is a great spring color and I've added a longish JCrew cotton cardigan in a color called shallow sea - looks more green to me than blue. Looks good with black slacks and a crisp white blouse for now. In summer, I'll put it with a white sleeveless blouse, white jeans and tan sandals. Like some of the others, I like olive too. I like to pair an olive cardigan with a pink or apricot top and white jeans. I think there's probably a green for everyone and I like the examples you've shown. 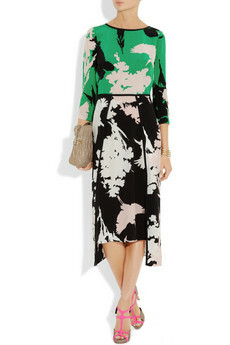 Love the basil dress. Hmm... I've gotten into green recently (after thinking I couldn't wear it). 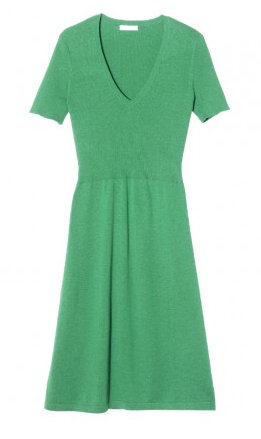 I've got a jade green sleeveless, knee length knit dress that I'm loving, and a grass green top. But to me, spring is saying 'pink'! I love green, a blue undertone suits best. I am currently experimenting with mint green and loving it. Buying scarves or inexpensive T shirts is a good place to start.